Japan's Tourism Minister Mizohata Hiroshi poses with Executive Director David Oh (left) of The Seoul Times. 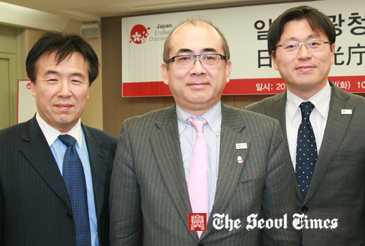 At right is Chung Yeun-Bom, director of the Seoul Office of the Japan National Tourism Organization (JNTO). A conference was held on the morning of Jan. 17, 2012 in Seoul. The purpose of the event was for Tourism Minister Mizohata Hiroshi to extend his gratitude and appreciation for the support that was given by the Korean people after the crisis Japan experienced “Korea sent gratitude and money, I cannot forget” stated Mr. Hiroshi. Japan is coming up to their one year anniversary, it is vital for the tourism market to bring in more foreigners to show Japans perspectives The growth of Korean tourists in Japan is extremely significant for the nation as South Korea is the largest market of tourists. In 2010, 2.44 million South Koreans visited Japan, thus accounting for 28 percent of the overall foreigners in 2010. Japan is one of Korea’s closest relatives, the flight time being only an hour and thirty minutes. Therefore it’s beneficial for both the nations to form a strong bond, especially when it comes to tourism opportunities. For this to happen, Japan would need support from the Korean tourism market, as they are currently more advanced. There are around 10,000 companies who specialize in tourism in South Korea. The tourism percentage from Japan to Korea has remained relatively stable,” perhaps due to the good reputation of K-Pop” suggested Mr. Hiroshi. The 2002 World Cup Soccer games held in both Japan and South Korea joined the two nations together, thus increasing the visitors for both countries. “It’s been 10 years since Korea and Japan joined together, this could be another chance to have a restoration between nations” said Mr. Hiroshi. Tourism is incredibly significant to the economy of many Asian countries. In particular Japan, as prior their economy was based on the manufacturing industry. Therefore, with the increase of tourism in Japan this would only benefit the society and economy. “By bringing in media, tourists and foreign ambassadors it will help restore Japan economically” explained Mr. Hiroshi. More importantly, tourism affects every industrial area therefore it will help increase developments and the remaking of certain areas in Japan. A lot of support for Japan was expressed through blogs, Twitter and YouTube. The J Route campaign starts off in March 2012, to promote 24 areas in Japan by using videos, websites, advertising and smart phone applications. The website also includes real pictures taken in Japan and testimonials from travelers around the globe who have visited Japan. For details or inquiries contact Manager Yu Jin of the Seoul Office of Japan National Tourism Organization (JNTO) at 777-8601.